If you close your eyes and imagine the streets and winding lanes that vein Delhi, their names function as chapters in its multi-layered narrative. Even for those who have inhabited this city for decades, the majestic ruins scattered across it may have gone unnoticed. It is in these ruins that stories of invasion, victory and defeat crouch. Delhi is not a walking-friendly city. You may tour its innards and learn of its contours on buses or in auto rides, but it is seldom that you’d know the story behind the naming of a street or a certain locality. Take Chandni Chowk, for instance. Situated within the walled city of Shahjahanabad (what is today known as Old Delhi), Chandni Chowk was a 19m wide and 1.4km long road that connected the Red Fort’s Lahori gate to the Lahori gate at the city’s walled circumference. Back then, at its centre, was a lone water tank. On a full moon night, the water would reflect the pale moonlight and set the surrounding areas aglow. Thus the name ‘Moonlight Square’. In the 18th century, this once-decorated thoroughfare was quite popular among the elite. A paper titled “Economy of the City of Delhi: 1707-1761", published by the Indian History Congress, quotes a Dargah Quli Khan who visited the market in 1738: “Chandni Chowk is a place where important people come for entertainment and pleasure, and sight-seeing for beauty and elegance. Articles of every description are found in its adjoining streets… on one street are jewelers where rubies and pearls and all the gems are available in plenty. On another side are the perfumeries, oil apothecaries." Today, the entire locality is known as Chandni Chowk. In its swollen arteries, people wander at an alarmingly unhurried pace. It is a theatrical setting: in a corner, a streetside ear-cleaner peers into the ear canal of a customer; men cycle by carrying cotton candy bouquets; overcrowded rickshaws pedal through tiny by-lanes; goats are dragged on a leash; and men wearing rings made of semi-precious stones walk by with caged parakeets. The streets are swarming—too many feet, too many eyes, and if you are a lone woman walking about with a camera around your neck, too many wagging tongues. Shuttle across seven metro stations towards the heart of modern Delhi, from Chandni Chowk to Jor Bagh, and you will find yourself in close proximity to Lodhi Gardens. A city landmark today, this park was not always called so. On the same land once lay the village of Khairpur. “Khair means ‘well-wisher’ or ‘good’," explains Vikramjit Singh Rooprai, a city historian who has been studying Delhi and its past since 2009. The village was uprooted and relocated in the 1930s by the British and a vast manicured park was built in its place, orchestrated by Lady Willingdon, the wife of Lord Willingdon, the then Viceroy of India. “If you enter Lodhi Gardens from Rajesh Pilot Marg, the original gate built during the inauguration is still there. The stone still has ‘Lady Willingdon Park 1936’ inscribed on it," says Rooprai. As part of the area’s beautification process, a baoli (step-well) disappeared along with the village. Once an important water source for the village, it was buried and forgotten. In the years to follow, the park was re-sculpted and landscaped by foreign architects like Joseph Allen Stein (who also designed the adjacent India International Centre and the Triveni Kala Sangam, a 10-minute drive away). Over the years, the 15th-century tombs of emperors belonging to the Lodhi and Sayyid dynasties were carefully enveloped by trees and ponds. After Independence, the gardens were renamed as Lodhi Gardens, and gave their name to Lodhi Road, the thoroughfare that skirts the park to the south. Next, hop into an auto rickshaw and request the driver to take you to Siri Fort. He will negotiate his way through the closely-stacked coral-hued buildings of Andrews Ganj, turn out towards Ansal Plaza (the first mall in the city, opened in 1999), breeze through August Kranti Marg, hemmed in by jamun, neem and gulmohar trees, and drop you off near Siri Fort Auditorium. It is likely that the driver wouldn’t know where the actual fort is. Even fewer know why the place is called Siri. “You’ll have to turn to the history books, not me," says 50-year-old auto driver Bikhan Ram, smiling behind his walrus moustache. “I’ve been working for the last 30 years and have passed this place many times. Never once thought about its name." Historians offer a fable: It is said that the name of Siri Fort—which once contained an entire city within it—is soaked in the blood of 8,000 severed heads. Sir and sar translates to “head" in Urdu and Hindi respectively. In her book The Forgotten Cities Of Delhi, historian Rana Safvi writes on the city of Siri (which was called Dar-ul-Khilafat, or Seat of the Caliph): “Sultan Alauddin Khilji (1296-1316) built this city between 1297 and 1307 AD to defend his kingdom against Mongol invaders." At the time, his army chief Ghazi Malik successfully defended Khilji’s empire from the foreign invasion. It is said that the heads of the defeated Mongols were later embedded into the city’s walls. Today’s neighbourhoods of Hauz Khas, Green Park and Shahpur Jat fall in the area that was once located directly outside the fort. “The remaining Mongols who escaped Khilji’s wrath scrambled to take refuge far away. They hand-built a small settlement that today has grown into a locality known as Mongol Pur Kalan in north-west Delhi," says Rooprai. Ghazi Malik would go on to be known as Ghiyas-ud-din-Tughlaq—the man who began the reign of the Tughlaq dynasty, which ruled for almost a hundred years. He ordered the construction of Tughlaqabad, the fourth city of Delhi. The remnants of Siri Fort—its once marvellous bastions—are now dwarfed and weathered down. Five kilometres away, nestled within the leafy R-block residential area in Hauz Khas (which itself was named after a 13th century royal water reservoir—in Urdu, hauz means a water tank, while khas refers to something special), sits Chor Minar, a monument made of rubble masonry that looks like an overturned cup placed on top of a rectangular platform. There is an equally brutal story behind the Chor Minar. Built during Khilji’s reign, 225 holes dot the circular structure like vacant eyes. It stands in the middle of a small, gated lawn, where children play on cool evenings with their plump dachshunds and hula hoops. Centuries ago though, this location would not be a place for children; this was where the decapitated heads of criminals would be suspended from the bamboo poles which used to be inserted in the minaret’s holes. The macabre sight was meant to strike fear in the hearts of thieves and frauds. “Khilji came to the throne of Delhi Sultanate at a time when the Mongol threat was escalating and he had to maintain a huge army," writes Safvi. “He could not therefore afford mismanagement, inflation, cheating and deceit." Today, Chor Minar stands quietly by itself. Walk slowly around it and all you’d hear is the staccato of shrieks from a coterie of bats. 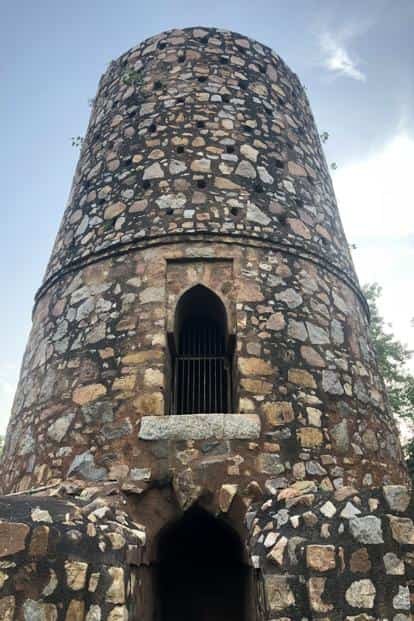 About 10km to the north-west of Hauz Khas is Dhaula Kuan. It is one of the busiest road intersections in the city and spills vehicular traffic towards Gurugram in Haryana. The place adopted its name from a landmark that was built possibly 200 years ago—it was where travellers would stop to take rest. “Dhaula means ‘white’ and kuan means ‘well’," explains city historian Dr. Swapna Liddle of the Indian National Trust for Art and Cultural Heritage (Intach). According to Liddle, the stones of the once-famed well were white in colour. The 40-50-foot-deep well, now defunct, still exists. It is hidden in the corner of a 70-acre lawn, and is now under the supervision of the Delhi Development Authority (DDA). After a 5-minute walk from the Dhaula Kuan metro station (on the road that leads to Indira Gandhi International Airport), turn left onto a dirt track through a broken-down grill gate. In a corner, there is Mahadev Chai Stall, where rickshaw and taxi drivers converge for tea-breaks. A wooden board, dislocated and cast away as garbage, rests on the side. It reads in Hindi: “Your safety is in your hands". Fifty two-year-old Mahavir, with closely-trimmed hair, is a maali. He has been the caretaker of the lawn since 1982. The lawn is often visited by labourers who, in the evenings, settle under a tree, slip out their bottles, play cards or rest. Mahavir curiously peeps out of his small office window when he sees a new visitor approaching. He is reticent at first but when nudged slightly, begins to talk about the well’s recent history. “They call it the white well because there used to be white water in it," he grunts in Hindi. “I’ve seen it with my own eyes," he adds. The said water was possibly white because of the mica minerals that laced the stones in the surrounding area. When the water receded completely nine years ago, the well was closed. Today, it is covered by a flat, rusted circular grill. “This used to be an important water source for travellers. Between Karol Bagh in West Delhi and here (a distance of about 12km today), this was the only well," says Mahavir. “Today, nobody comes here. It’s forgotten like many other places which were once the lifeline for many."